We're old enough to remember a time when an automotive brand wouldn't have to re-invent itself three times in a decade. Those were simpler times, but nowadays the automotive landscape is fierce and fraught with uncertainties. On top of that, the addressable market has demands that seemingly morph by the minute. Welcome to Acura's hellscape. Yes, Acura is working on its 3rd identity of the present decade. And evidence of this is embodied quite nicely in their entry sedan, the ILX. Based upon the 9th-generation Civic global compact architecture, the ILX first entered the Acura lineup in 2012 as a 2013 model alongside the 2nd generation RDX. The two models signaled a new design direction for Acura, a direction which was seemingly intended to help us forget about Acura's troubled "keen edge" design movement of the late aughts. In general, this was a necessary move for Acura, but it didn't take long for the ‘new' look to be seen as a bit too ordinary, particularly in the "premium" luxury segment. The drab color palette certainly didn't help things. Acura recognized this, so to jazz things up a bit, they redesigned the grilles to be a bit more bold, with Acura logos the size of dinner plates, and new "Jewel Eye" headlights became a signature item as well. It turns out, this wasn't quite enough, and shortly after that, Acura introduced their "Precision Concept", which brought new design elements such as the "Diamond Pentagon Grille" and reshaped headlights and taillights. Oh, and exposed exhaust tips. The ILX is the last Acura in the lineup to have "Precision" design applied to it, and it's the only Acura to have been subjected to all 3 design identities of this decade. We were quite intrigued by the ILX when we first learned that it would be bolstering Acura's sedan offering, but that gave way to a sense of indifference, if not outright disappointment when the rubber actually hit the road. ILX Hybrid - 1.5L IMA – 111hp (this is not a mis-print). Underpowered, overpriced, underwhelming to drive. Yawn. Would you believe us if we told you that the ILX Hybrid with the Tech package stickered for over $35k (including destination)? ILX 2.0 - 2.0L 150hp 4-cylinder (R20), 5-speed automatic. Mildly more interesting to drive than the Hybrid. Still overpriced, underpowered, and underwhelming. ILX 2.4 - 2.4L 201hp 4-cylinder (K24), 6-speed manual. YAY, did you say SIX-SPEED MANUAL? Yes. Well, that's the best news of this one. The powertrain is solid, but not exactly explosively powerful. Still, it was somehow too much for the ILX's chassis, with undersized brakes, no limited-slip differential, greasy all-season tires, and mushy springs and dampers. Pass. Over time, Acura dropped the Hybrid trim level of the ILX, and by 2015 we were left with the 2.0 (5AT-only) and 2.4 (6MT-only) trims. The ILX's first MMC (mid-cycle model change) came in 2016, and brought the aforementioned Jewel Eye headlights as well as a further simplified lineup with a new powertrain. The 2.0L trim level was (mercifully) retired. Unfortunately, so was the 2.4L 6-speed trim. Both were replaced with a newer version of the K24, featuring direct-injection, and a 10lb-ft boost in torque for a maximum of 180lb-ft, but the same 201hp. The only transmission offered on 2016-up ILXs is an 8-speed dual-clutch transmission (DCT) which is connected to the engine via a torque converter. The chassis was enhanced and an A-Spec trim added to help spice things up a bit further. These enhancements helped increase the fun-to-drive factor quite a bit, but with it topping out at nearly $36k, it still felt somewhat overpriced. For 2019, the ILX is mechanically identical to the 2016-2018 models for all practical purposes. But the interior and exterior both benefit from significant updates, and now AcuraWatch™ is standard on all ILX trims. 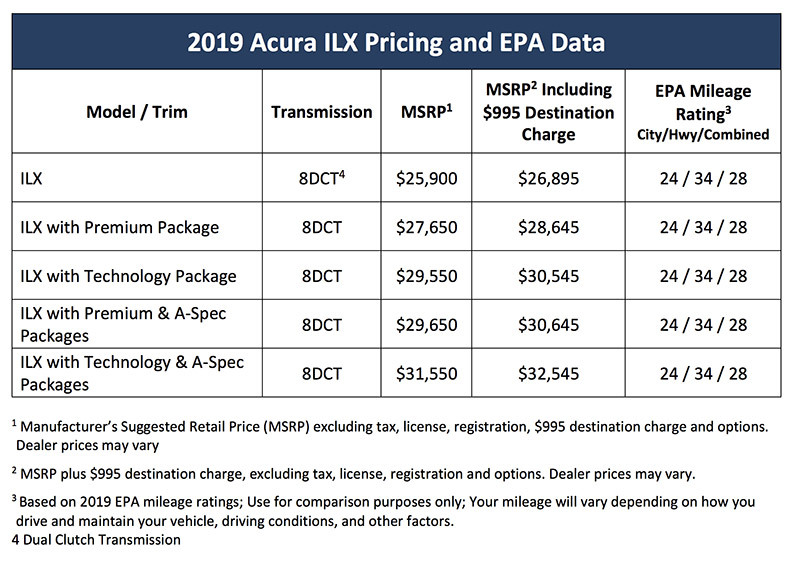 Perhaps most significant for 2019 is the massive price cuts across the board for the ILX. At $32,545 (including destination) the top-of-the line ILX A-Spec with Technology Package lists for a whopping $3,550 less than the 2018 model. The base ILX starts at $26,895, which itself is $3500 less than last year's base ILX (with AcuraWatch™ Plus Package). The exterior updates are quite obvious, with the new diamond pentagon grille treatment, a new sculpted hood, new 7-lamp Jewel Eye headlight design (vs 5-lamps on the 2018), new LED foglight design, a new front fascia, a massive Acura logo in the grille, new wheel designs, an entirely new design for the rear fascia, taillights, and even a new location for the license plate. So far the general response to the styling updates seem to be generally positive, and the ILX throws off a more aggressive, sporty vibe than the previous iterations. If you've paid attention to Acura's latest ad campaigns, you'll notice a recent emphasis on bright, punchy colors. The ILX jumps right in line with this theme, even offering 4 "premium" colors ($400 option) to an expanded palette. Lunar Silver Metallic and Modern Steel Metallic are familiar, but new for 2019 is a gorgeous Platinum White Pearl, Canyon Bronze Metallic (requires Premium Package), Majestic Black Pearl, Performance Red Pearl, and (A-Spec exclusive) Apex Blue Pearl, first seen on the 2019 Acura RDX. Of these new colors, the latter four are "premium". Inside the car, the ILX benefits from a new seat design, similar to the thrones found in the all new 2019 RDX. To add to the sporty ambiance, these seats are now available in RED with Ultrasuede inserts. In Premium and Technology Trims, the ILX also gets an updated version of Acura's Display Audio system (featuring Apple CarPlay and Android Auto) with its dual screen On Demand Multi-Use Display™ (ODMD 2.0) interface. The Technology package adds ELS Audio and built-in navi. Unfortunately, the ILX only offers a lone USB port, regardless of trim level. Acura hosted a "full line" 2019 model year press event in Columbus, Ohio last week. While the star of the show was clearly the brilliant (Thermal Orange) 2019 Acura NSX, we also had the opportunity to spend some time driving the restyled 2019 Acura ILX A-Spec on the street. The updated interior is nice, though it's hard to forget that the basic design is over 6 years old already. The new seats are quite comfortable, but just like the 9th generation Civic, the seating position feels really high. This was actually by design, as the engineers developed the car for a higher "H-point" (hip point). This is not to my personal liking, and unfortunately even at the lowest setting it feels too high for my tastes. Most of my time inside the car was spent driving it, but I did take a few minutes to play around with the Display Audio system, using both Apple Carplay and Android Auto. This was an interesting interface for me because it uses the upper display, and thus employs the dial interface as opposed to the typical touchscreen. For the most part, it was fairly intuitive to use, but I would like to spend more time messing around with both systems before making the final call. As mentioned, our time behind the wheel was limited to about 25-30 miles of local roads and a brief stint on the freeway. Overall the car drove quite well. What really impressed me was how eager the engine and transmission felt this time. I say "this time", because the first time I tried a 2016 ILX with the updated powertrain, I expected it to feel much quicker than the (much heavier) TLX. The ILX uses the exact same engine and transmission as the 2.4L TLX, but the ILX's final drive ratio is taller so it really didn't feel any quicker than the TLX. With that said, the 2019 ILX that I sampled felt much more energetic than I had remembered from my last experience. Jonathon Rivers, Sr Product Planner for Acura was actually riding in the car with me during this drive, and I asked him what had changed mechanically. He indicated that it was basically unchanged (and I later verified this via the specifications) though it's possible that there were calibration changes to the engine and transmission. Whatever they did was pretty impressive. In this day and age where relatively normal cars are routinely putting 0-60 in the 4-5 second range, "fast" has a new meaning, so I won't say the ILX is FAST, but it's no slouch at all. It wouldn't surprise me if the car I drove was able to click off low 6s or even high 5s, which is plenty respectable. I'll have to get my hands on another one to see if it was a fluke. Overall the K24 was a real pleasure, offering immediate torque response ¬(the kind that can only be offered by a naturally aspirated engine) and pulling smartly all the way to the 7000rpm redline. And it sounded really good. With the way it climbed so quickly through the gears, it almost sounded angry. The 8DCT transmission performed flawlessly and seemed to always have the perfect gear ready in a flash to give you a surge of acceleration at any moment's notice. Shifts in either direction were absolutely seamless and executed with lightning quickness, whether shifting itself or responding to inputs from the standard paddle shifters. So far, so good, right? Well, there are a few minor quibbles. One is the steering. It's just too light for my tastes, and a little on the slow side. This car would benefit greatly from Acura's Integrated Dynamic System (IDS), or some way to give the steering a bit more heft. As it is, there's only a "Sport" mode for the transmission. A quicker steering ratio would help as well. Another thing is traction. With such an eager powertrain, it's pretty easy to light up the front tires from a dead stop, or through tighter turns. A limited slip differential would work wonders. With that said, the chassis is very good. While we've been spoiled by the greatness of the 10th generation Civic and Accord architectures, the ILX's 'heritage' platform still acquits itself quite nicely. Of course the natural tendency is towards a mild understeering nature, but in general the ILX turns in and transitions willingly. The structure itself feels nice and tight, and it does a good job of keeping road, wind, and tire noises to a minimum. It does seem to exhibit a bit more body roll than the newer Honda architectures but it still holds the road quite nicely. It was a lot of fun whipping the ILX through the rolling hills of Ohio's twisty backroads. The 2019 ILX suddenly has a lot more going for it than it ever has. Styling is always a subjective thing, but a lot of folks seem to really like what Acura's done with the ILX. The tech quotient has been increased, the drive is sporty enough to keep things entertaining, but it's not so sporty as to severely compromise comfort – you could say it strikes a youthful balance. If you were hoping for a hard-core compact sport sedan, then this probably isn't the car for you, but if you need a comfortable, reliable and efficient commuter that has a seriously spunky side to it, then this could be a perfect fit. Combine these virtues with Acura's aggressive pricing strategy for the ILX, and it has really strengthened its position.